In the depths of blood orange season are we. My local grocers has become inundated with swathes of them – 4 for a pound. This is good news. More tart and vibrant than their not-so-gory brothers, blood oranges are well employed in the savoury side of food (see my recipe for Blood Orange and Couscous salad). 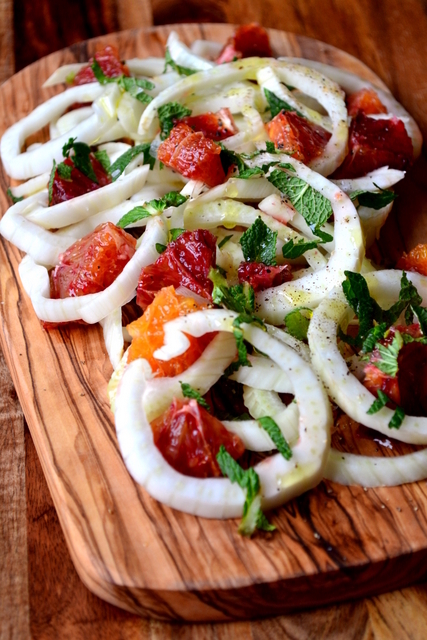 Added to any salad, particularly this recipe for Blood Orange and Fennel Salad, they immediately liven things up, bestowing colour, flavour and a refreshing juiciness. 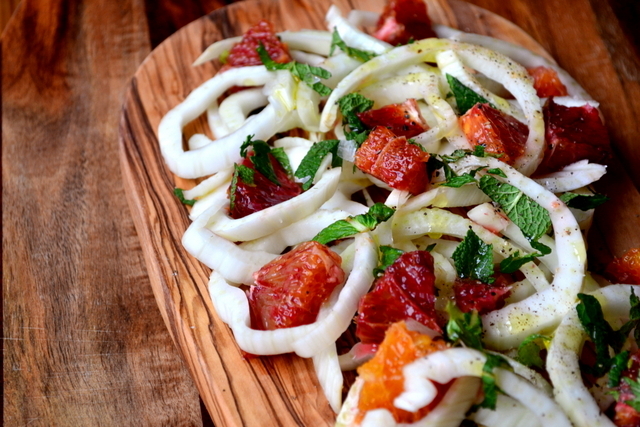 Blood oranges and fennel work well together on every level. When preparing a salad, a vital consideration should always be texture. Textures can make or break a salad. 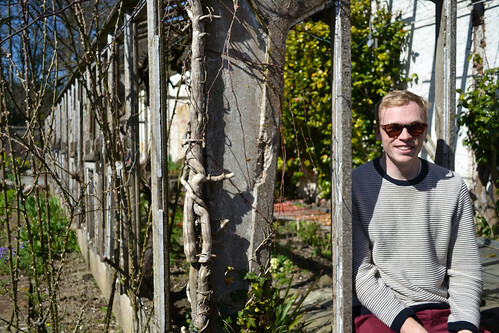 Too many textural elements can be overpowering, while too few will bore. So stark is the contrast in texture between fennel and blood oranges – one crisp, the other soft and juicy – there can never be a dull moment. Whereas aniseed might well overpower the flavour of a “standard” orange, the robust tartness of the blood variety stands up rather well to the pressure. The additions of fresh mint, olive oil and salt add depth of flavour, making for a complex but wonderfully delicious outcome. It seems almost serendipitous that the weather has finally improved and the sun is shining; the perfect setting for this light and scrumptious salad. Trim the pith from your orange, quarter and slice thinly. Finely chop your whole fennel so it appears as below. 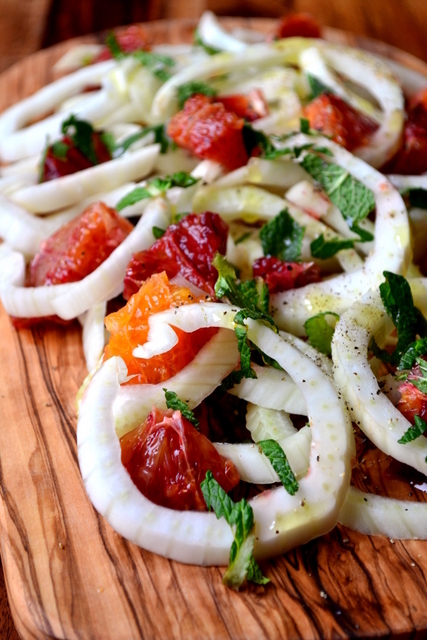 Arrange the blood orange and fennel on a plate or presentation platter and sprinkle over the mint. Drizzle generously with olive oil and finish with a few crystals of salt. Serve as a side or light lunch. Cost: As I mentioned, blood oranges are inexpensive at this time of the year – don’t you love the seasons?! Fennel is fairly cheap year round too. By my reckoning, you could serve up this salad having spent no more than about £1. Two of my favourite things: blood oranges and fennel. Gorgeous salad!! Mine too – though I’ve only recently come around to fennel. I never used to like it – not a huge fan of aniseed – but I’ve totally come round. Great salad! I often do this as fennel so prevalent and Italy. For added crunch I sprinkle with flaked almonds. That’s a nice idea, Claire. I’ll have to give it a try next time! Can you make this without getting red juice all over yourself? Yes, I can confirm that it’s possible! This is one of my favorite salads — the colors are glorious! It’s just so light and refreshing – the perfect salad perhaps? Looks like a match made in heaven, beautiful! Thank you, they work very well together. This sounds/looks amazing! Love the simplicity and colors! Love the combination of fennel and citrus – there is a similar salad in Sicily which also includes black olives, really good too! Oh that sounds delicious, I must try it! It looks beautiful. I really should try blood oranges again as I’m sure I’d love them now. The name put me off when I was a child and I couldn’t face eating them and somehow ever since I’ve always avoided them. Thank you – you must. Yes, a bit gory but so delicious too! Thank you! Well, the weather here has been awesome for three days. I actually got a sun tan! So vibrant and fresh! 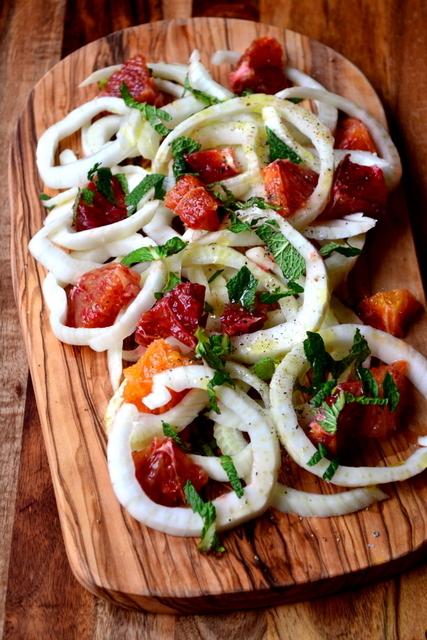 I make an orange and fennel salad, but with pedestrian orange oranges, lol. I’ll have to jazz things up! Yes, get some blood oranges! They really are fantastic!